I’m on the road again for a short trip. I’m not that young, but I still get around pretty well, love driving trips, love exploring new things. I can keep up pretty well with my grandkids, which is my goal. You’ve all seen them when you travel, the bus loads of old people on tour, you’ve probably tried to avoid them when you can, along with bus loads of noisy kids. They’re both a nuisance, you may think. This week I was in Hannibal, Missouri. If I have to tell you the main reason people travel there, then you need to look it up. At the hotel where I was staying, there was a bus load of Geezers, Geezers from Kentucky. I need to remind you that these are my people, I am one of them, some are younger than I am, I can actually relate to them. I watched them, wearing their name-badges around their necks, waiting to go to their next meal or their next tour, visiting with each other, laughing and telling stories. My thoughts on the Geezers on the bus was “Good for them!! !” They don’t feel safe driving anymore, they don’t want to deal with reservations and bags, but they want to be out seeing and doing. Some of them had canes or creaked along, but they were out there doing it! They weren’t sitting around thinking about their lives, they were out there experiencing it. And laughing and learning and enjoying friends and making new ones. Thank you for these tours, for the bus drivers who take care of them, for the people who take them. The other Geezers I watched in Hannibal on a Monday in July were the ones who were traveling with family. A few had brought a young grandchild along. I watched a boy about 8 rolling his eyes while his grandfather explained about Mark Twain and Tom Sawyer as we stood near the famous whitewashed fence. Someday, that boy may bring his grandson here, too. Hopefully, the memories will be strong when he looks back. The grandparents were loving watching their grandchildren ride on a riverboat for the first time, taking pictures, a gift for all generations. As I travel around, I’m grateful I can still get there on my own, but I’m happy for my contemporaries and my elders, because there are still a lot of people older than I am, who are out there. 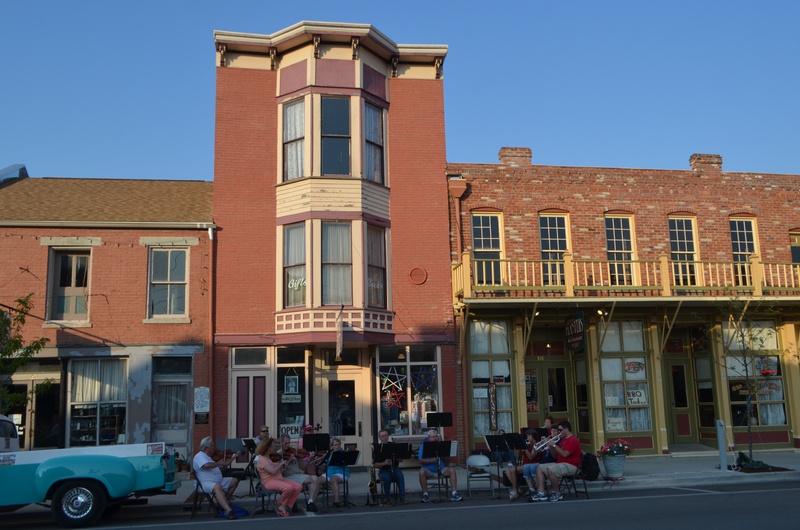 On a Monday night, visitors gathered to listen to a band play old tunes in front of an ice cream parlor. Many were older, sitting on benches, humming along. Lovely.